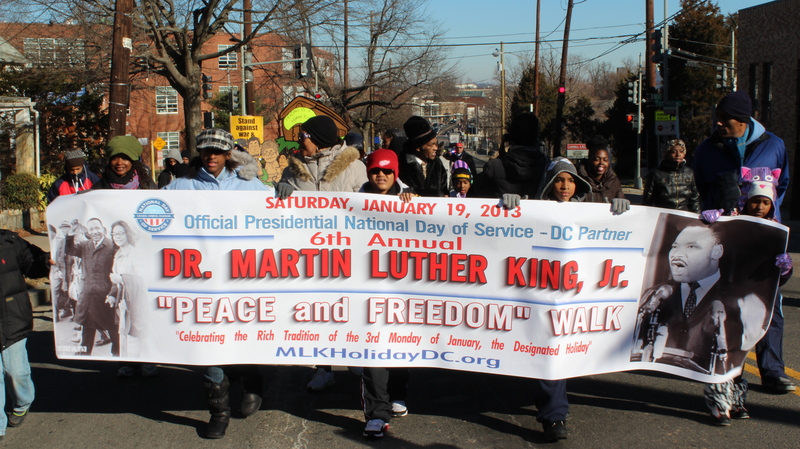 (PHOTOS) MLK Holiday Peace and Freedom Walk 2013 — Washington, D.C.
T he 35th annual Martin Luther King Holiday Peace and Freedom Walk was held on Saturday, Jan. 19. Prior to the parade’s departure, marchers assembled at the United Black Fund at the intersection of Martin Luther King Avenue and Howard Road SE for a program of speakers and performances. Several groups led by the Wong People paraded from the United Black Fund and traveled down Martin Luther King Avenue until they reached Shepard Park at Malcolm X and MLK Avenue SE. The groups included but weren’t limited to the Cass Technical High School Marching Band of Detroit, Total Sunshine, the A.N.S.W.E.R Coalition, Men in Motion and Empower DC. Several speakers from around the District community engaged the crowd with reflections of Dr. King’s life, songs, poems as well as calls for action for issues affecting D.C. such as gun violence, statehood and the proposed public school closures. Actor Nick Cannon addressed the marchers at the UBF. At Shepard Park, the community sang along with the DC Labor Chorus and heard words from DC Mayor Vincent Gray and Washington Informer publisher Denise Rolark Barnes amongst many others. Barnes’ parents, Calvin Rolark and Wilhelmina Rolark along with TV and radio personality Ralph Waldo Petey Greene, started the MLK holiday parade tradition in 1977. View the pictures from the holiday parade below.